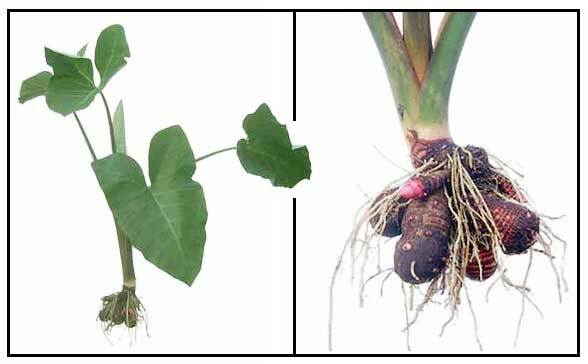 Gabi - Taro /ˈtɑroʊ/ is a common name for the corms and tubers of several plants in the family Araceae. Of these, Colocasia esculenta is the most widely cultivated, and is the subject of this article. More specifically, this article describes the 'dasheen' form of taro; another variety is called eddoe. 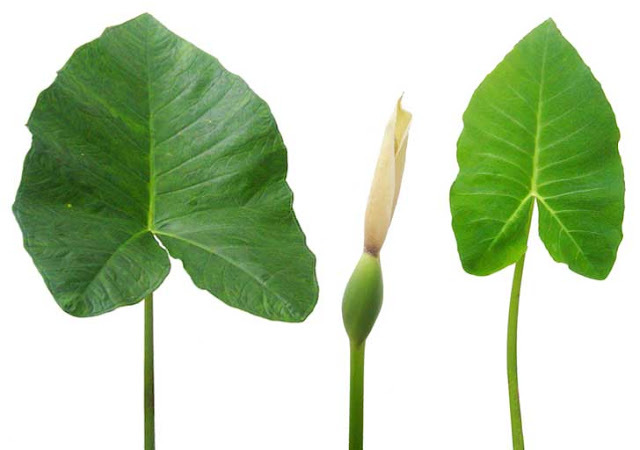 Gabi / Taro is native to southeast Asia. It is a perennial, tropical plant primarily grown as a root vegetable for its edible starchy corm, and as a leaf vegetable and is considered a staple in African, Oceanic and Asian cultures. It is believed to have been one of the earliest cultivated plants. Colocasia is thought to have originated in the Indo-Malayan region, perhaps in eastern India and Bangladesh, and spread eastward into Southeast Asia, eastern Asia, and the Pacific islands; westward to Egypt and the eastern Mediterranean; and then southward and westward from there into East Africa and West Africa, whence it spread to the Caribbean and Americas. It is known by many local names and often referred to as 'elephant ears' when grown as an ornamental plant.